Trying to show three dimensions using a two dimensional medium like photography is not easy. Landscape photographers use various concepts to create the feeling of depth in their photographs. Below are two such concepts with examples. 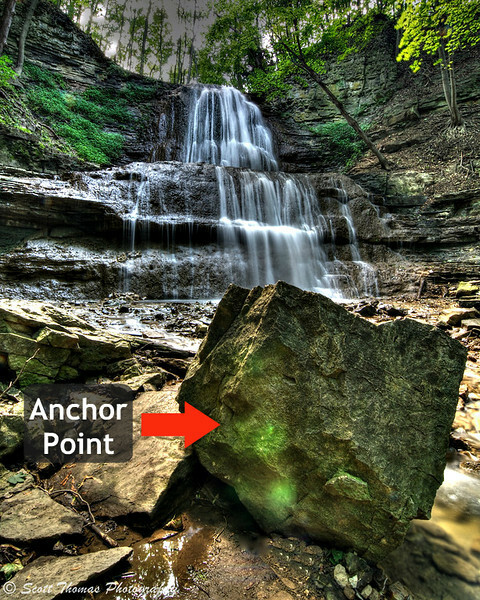 Anchor point of a Landscape photograph. Nikon D7100/Tokina 11-16mm, f/22, ISO 100, EV 0, 11mm (16.5mm DX) focal length, tripod, HDR Image. The big rock was hard to miss as I walked up to the waterfall and immediately composed a few photos using it as the anchor point. If you go back to my previous blog, you will notice the use of anchor points in those photos, too. A word about the HDR processing for this Sherman Falls image. After I brought it into the Photomatix Pro plugin for Aperture 3, I found a black and white filter I really liked. Except, it was black and white. I brought back the color saturation to 50% and liked how the color on the rock contrasted with the waterfall. A little extra work in Apple Aperture 3.4 finished the image. The next concept I call Small Subject, Big Landscape. Moose refers to it as his favorite technique when photographing a small subject like a plant or small animal and include the environment in which it lives. When reading about this, I immediately remembered the photo you see below. I took it in the North Dakota Badlands of Theodore Roosevelt National Park. 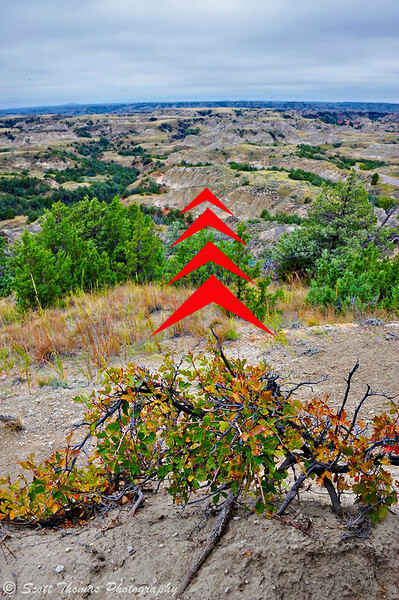 The red arrows indicate I was shooting over the small tree. My focal point was one third into the frame at top of the tree which gave me the hyperfocal distance at f/22. Small Subject, Big Landscape concept. Nikon D700/28-300VR, 1/60s, f/22, ISO 800, EV +0.3, 28mm focal length. A little story to go with the Badlands photo. Being an Easterner, I was not being very cautious when going down on one knee for this photo. I found out fast to look for small cactus plants from there in out! These two concepts along with last week’s blog post should get you started in improving your Landscape photography. If they helped, please, post a link to your blog or photo in the comments. This entry was posted in Photography and tagged 28-300mm, anchor point, badlands, canada, concepts, hamilton, hdr, landscape, medora, national park, nikon D700, nikon D7100, north dakota, ontario, photomatix pro, sherman falls, theodore roosevelt, tokina 11-16mm, tripod, ultra wide angle, uwa, vr, water, waterfall. Bookmark the permalink. Very interesting technique, I see what you mean with “anchor point”. I will pay more attention with landscape photography. Thanks for your pictures, explanations and Moose Peterson’s link. Nice work Scott! You should go on a long tour of the U.S. taking nothing but nature shots. Bravo! You have a photo tour of the U.S. planned? Great post Scott very valuable info here as well some great images !! Hope you can make use of it, Bernie.